You mayyyy have noticed that I’ve developed a slight obsession with Greek Yogurt. I’ve been putting it in EVERYTHING. As in, ALL OF THE THINGS THAT I EAT EVER. And here’s another one. 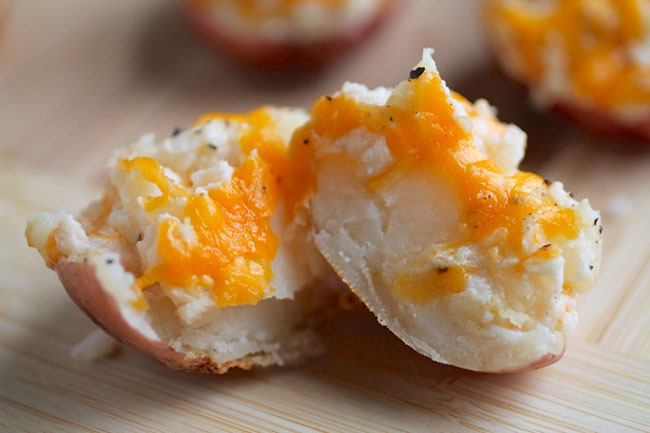 I am a sucker for twice-baked potatoes. I rotate through a few different versions, but this one is simple, tasty, and classic. The greek yogurt lightens up a traditional recipe without sacrificing any of the creaminess that comes with cheese or sour cream. 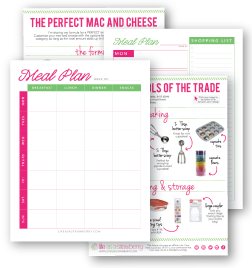 These are especially great because they are easy to make in advance. 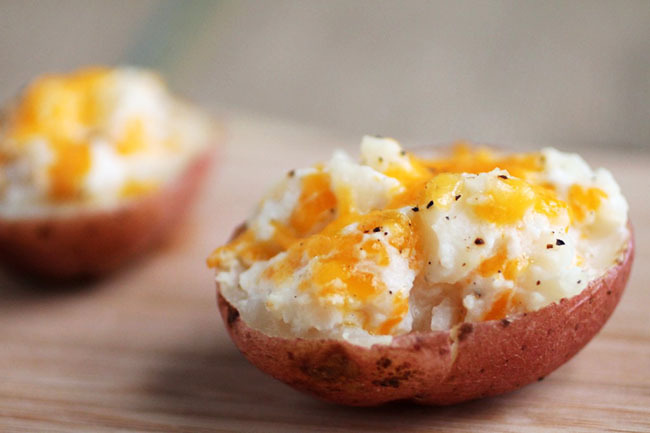 After stuffing them, refrigerate or freeze the potatoes until you’re ready to eat! Cheddar cheese, a bit of salt and pepper, greek yogurt, and BAM! Deliciousness. No other explanation needed. 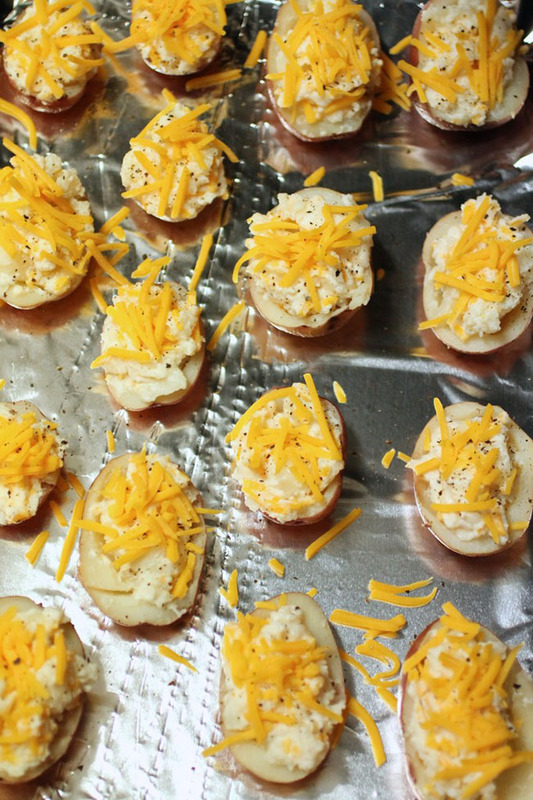 Spread potatoes in a single layer on a large baking sheet. Drizzle with olive oil and sprinkle with salt and pepper. Roast at 375 for 40 minutes, or until potatoes are slightly browned and easily pierced with a fork. Remove potatoes from oven and let cool until you can handle them without burning your fingertips off. Slice them in half and scoop most of the potato out of each half into a large bowl. Be careful not to take too much potato out – you still want the skin to hold its shape so it can support the filling! 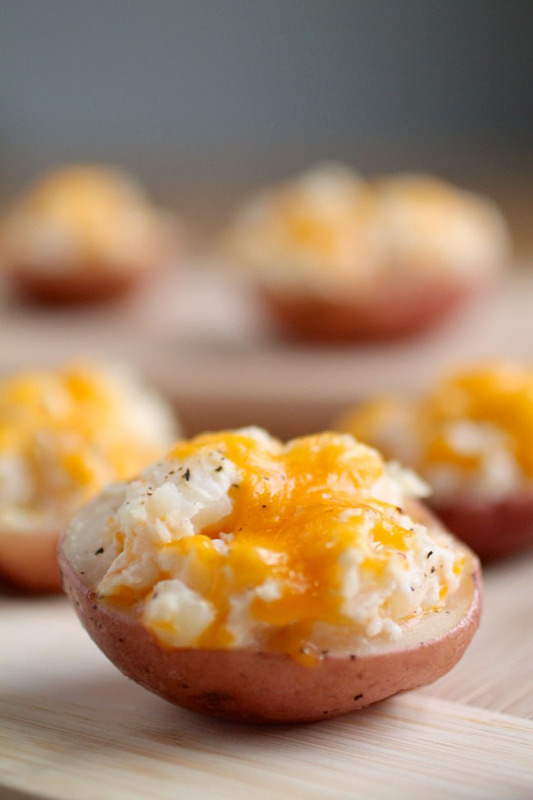 Add salt, pepper, cheddar cheese, and greek yogurt to the potato scoopings and mash well with a fork or a potato masher. Make the filling as chunky or as smooth as you’d like! I like my filling a bit chunky. Scoop the filling back into the potato skins and top with a bit of cheddar cheese and a sprinkle of black pepper. If you’re refrigerating or freezing the potatoes for later, pack them up after this step. When you’re ready to eat, pop the potatoes back in a 375 degree oven until the cheese is melted and bubbly, about 15 minutes. Leave them in a little longer if you like your tops crispy – I got impatient waiting for these to cook and pulled them out as soon as the cheese was melted, but generally I like them to be a bit browner. Serve immediately and enjoy!